Reusing Textiles - Planet Aid, Inc.
Americans throw away 85 percent of the clothes in their closet that they don't want, but almost everything can be reused or repurposed in some way. Planet Aid makes it easy to keep textiles out of landfills by placing our signature yellow boxes in convenient locations. Every pound of clothing collected by Planet Aid translates directly into significant environmental benefits. Perhaps the most important impact has to do with stopping the acceleration of climate change. The greenhouse effect, as it is sometimes called, is associated with increasing amounts of CO2 released into the atmosphere. We normally think of CO2 as coming from our car’s tailpipe or an industrial smokestack. However, when solid waste such as textiles are buried in landfills they release greenhouse gases as they decompose, including methane, a particularly destructive substance. Similarly, at the other end of the clothing life-cycle spectrum, the production of textile fibers and the manufacture of cloth burns considerable quantities of fuel that releases CO2 into the atmosphere. How much CO2 is saved through clothing reuse? 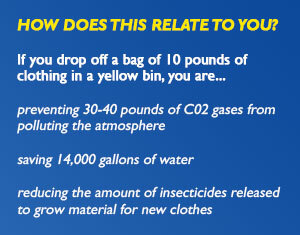 Approximately 3-4 pounds of CO2 are saved for every pound of clothing that is spared from disposal. This means that Planet Aid effectively saves 300-400 million pounds of CO2 from entering the atmosphere for every 100 million pounds of clothing we collect (which is approximately the quantity we collect each year). This is the equivalent of taking 26,000-35,000 cars off the road (According to the U.S. EPA, a passenger car emits about 11,000 pounds (4.75 metric tons) of CO2 a year on average). 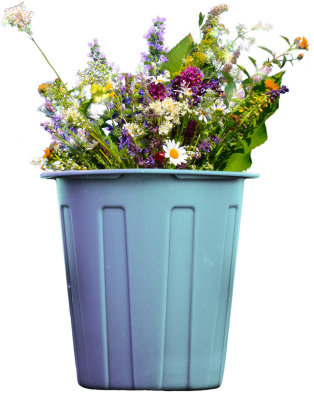 An obvious though sometimes forgotten benefit is that open space has been spared because 100 million fewer pounds of waste have been dumped on it (Planet Aid collects approximately 100 million pounds of clothing every year). Next, there has been far less insecticide released into the environment. That is because by reusing clothing rather than disposing of it, Planet Aid reduced the need for growing more cotton or other materials needed to produce the fabric for making 100 million pounds of new clothes. Given that approximately 0.02 pounds of pesticides are used to produce one pound of new clothes, there was approximately 2 million pounds fewer insecticides that could wash into waterways or otherwise harm the environment. These insecticides would have included some of the most hazardous nerve agents on the planet, namely, aldicarb, parathion, and methamidopho, which are used to protect cotton (the most commonly grown source of textile fiber) from being damaged by insects. Speaking of waterways, according to the World Bank, 17-20 percent of industrial water pollution is due to textile dyeing and treatment. In addition, the production of fabric consumes a surprising quantity of fresh water. One T-shirt, for example, consumes about 700 gallons of water. The 100 million pounds of clothing Planet Aid collected thus helped save about 140 billion gallons of clean water. Put into perspective, Americans drink 8.4 billion gallons of bottled water per year. In addition, cities, towns and counties also reap rewards as a result of Planet Aid’s work. By not having to collect and dispose of an extra 100 million pounds of municipal waste in the form of unwanted clothing, Planet Aid saved municipalities millions of dollars in associated costs.